Would Gonzalo Higuain Make Arsenal Title Contenders? 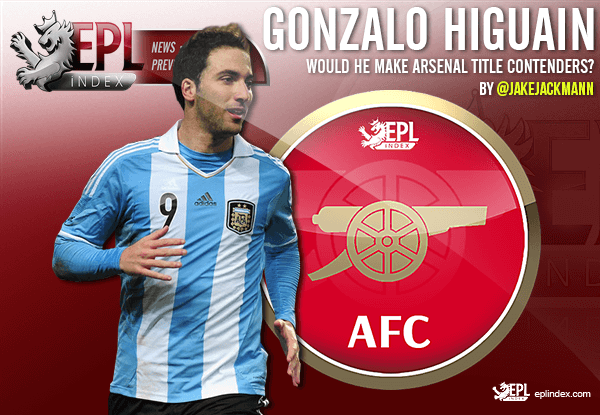 EPL Index > Arsenal > Would Gonzalo Higuain Make Arsenal Title Contenders? Arsenal are in the market for a new forward this summer and there have been rumours over the last couple of days that a move for Gonzalo Higuain is on the agenda. The Argentinian would be a huge signing and one that would send shockwaves around the Premier League. Arsene Wenger’s side need to have a huge summer to show their rivals that they are still there and that they will be a threat in the coming season. They have drifted under the radar due to the appointments of Antonio Conte, Pep Guardiola and Jose Mourinho. It is expected that Chelsea, Manchester City and Manchester United will be much better this year and that Arsenal missed their chance to win the title last season. It is important Arsenal make signings in crucial areas to put together a serious title challenge. The signing of Granit Xhaka has improved their central midfield area, which was lacking last season, with the club relying on Aaron Ramsey and Mathieu Flamini for large portions of the campaign. Although Ramsey is a good player, he wasn’t suited to playing in the double pivot alongside Flamini, who lost his legs last season. Xhaka is a really good midfielder, who will play deep and screen the back four, allowing the attacking players more freedom. He isn’t a destroyer, but he reads the game well and has a good eye for a pass. Although the Swiss international cost a lot of money, he will improve the Gunners’ first eleven making it a worthwhile investment. It is crucial that a top tier striker needs to be next on the agenda, and with links to the likes of Alexandre Lacazette, Romulu Lukaku and Alvaro Morata in recent weeks, it appears that the club are seriously trying to get one in. There have been worrying reports that they may not manage to get one in before the season starts, but that shouldn’t cause too much panic. It is difficult to negotiate a deal for strikers of that calibre, especially ones that are wanted at their current clubs, just look at Spurs’ lengthy chase of Vincent Janssen. Higuain is looking to leave Napoli and would be a good fit for Arsenal. However, Napoli will want a lot of money for their star man and will be looking to find a replacement before releasing him. If this deal is done, it will be one that carries on into August. It is clear why Wenger would be looking at Higuain as a potential target, as he is one of the best strikers in the world. He showed that last season, in his most successful campaign to date, scoring a record-breaking 36 league goals in Serie A. Higuain is a strong finisher, and his movement in the final third is responsible for many of the chances he receives. He also holds up the ball, and links up play well, both vital attributes that a striker playing at Arsenal must possess. The Argentine also scores frequently from range, which is another dimension to his game. He is certainly a cut above from Olivier Giroud, who is no means a bad striker, he just lacks the clinical edge required to belong in the top tier. Higuain is an elite striker, and Arsenal need to buy one this summer, or their title chances are severely hindered. Higuain is by no means a risk free signing, especially for the price that he would cost. He would likely be one of the most expensive players in history, with £80m mentioned in some reports. There are doubts about his big match mentality, after missing guilt-edged chances in two Copa America finals and of course the 2014 World Cup final. Argentina could have had three trophies in the last three years if Higuain took chances that he would routinely take at club level. Also Napoli faded in Serie A last season, and although Higuain’s goals didn’t dry up completely, he was having less of an impact in the matches that mattered. The matches in February against Juventus and AC Milan were crucial to their title hopes, and the Argentine didn’t play well in either. His poor performances in big matches will be a concern that Wenger has. If Arsenal are seriously pursuing the Argentine striker, it will tell us a lot about their intent for the coming season and the future. Arsene Wenger has always preferred to plan for the long term and target young players who are not yet the finished article. At the age of 28 and the price of a rumoured £80m, Higuain isn’t your typical Arsenal signing. It is similar to Manchester United signing Robin van Persie in what turned out to be Sir Alex Ferguson’s last summer, as he knew that signing the Dutchman significantly increased their title hopes. If Arsenal sign Higuain, it could signal that Wenger is planning on leaving at the end of the season. The rumours that Olivier Giroud could be part of the deal add to that theory, as although Arsenal would be strengthening their first eleven, their squad would be equally susceptible to injuries. It is an interesting story and he would certainly improve the Gunners if they manage to get a deal done. He is the world class striker that the squad have been lacking and would show that Arsene Wenger is serious about challenging for the title. Although the Premier League has many top managers taking over at new clubs, the stability at Arsenal could be an advantage. There are rebuilding jobs going on at rival clubs and they may take a year to adjust to the philosophies of their new managers. Arsenal already have a good team and with the right additions, they could start the season as title favourites. Categories: Arsenal, Arsenal (NN), EPL Index Featured Article, and EPL Transfer Analysis.' 'Tags: AFC, Alexandre Lacazette, Arsenal, Arsenal (NN), Arsenal Stats, english Premier league, Gonzalo Higuain, Granit Xhaka, ramsey, and Romulu Lukaku. How will Gonzalo Higuaín improve Arsenal? Gunners Panicking? Who can Arsenal Bring in?